This beautifully designed book has fun flaps to explore and a sound bar to help children interact with the pets on each page. Each of the five sound buttons in the sound bar provides one animal sound. Children look at the photograph on the page, find the sound button with that same picture, and press it to hear the animal sound. 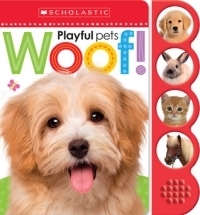 With flaps to lift, engaging photography and lively text, children are encouraged to interact with the book while they learn about different pets and the sounds they make.